What we are looking at here is a bat one-way cone that was installed at an active area located next to a stone chimney. If you look closely, you will see a bat that is roosting on the outside of the cone. This is a rare sight! While we know our tactics to keep the bats out of the house are effective. It is not common to see a bat that was not able to get back inside still "hanging around". 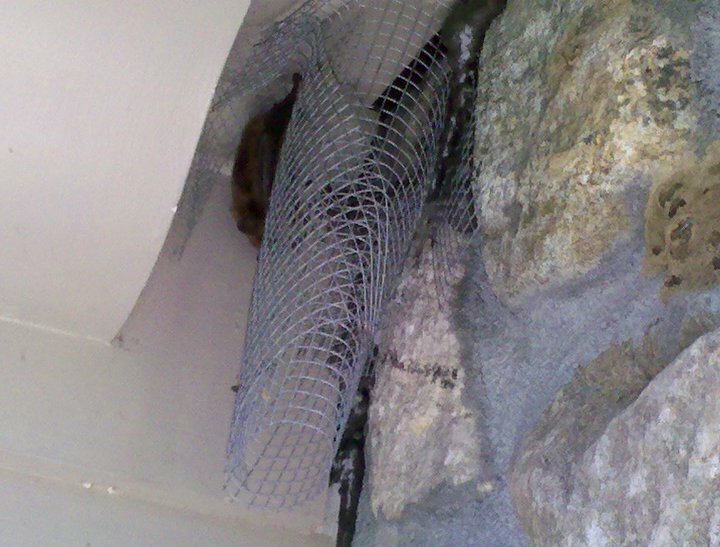 It is not uncommon though for us to find evidence that bats have been roosting. We receive quite a few calls from existing customers that find bat guano (droppings) on their chimney or on the ground where that bats had used to gain access to the home in the past, prior to the bat exclusion being performed.